On-demand platforms. Freelancers. Precarious work. The “Gig Economy.” What do these terms mean? How is work actually changing? Find answers to key questions regarding the size, makeup, and challenges of gig workers here. The Gig Economy Data Hub provides an accessible, comprehensive analysis of available data sources to answer critical questions about independent and gig work in the United States. A freelance graphic designer earns $25,000 for an ad campaign. A teacher drives for Uber on the weekends. An electrician owns and operates a successful small business. A stay-at-home mom sells Mary Kay cosmetics on Facebook. A recent immigrant cleans houses under the table. A retired woman knits hats to sell at craft fairs. What do these workers have in common? Independent or gig work consists of income-earning activities outside of traditional, long-term employer-employee relationships. We know what it is not. But what Is independent work? What types of work does it include? There are several ways of describing gig work. There are several ways to size the gig economy and independent workforce. Some count the total number of workers who participate in any form of independent work. Some only count those who rely on independent work for their primary earnings. Gig and independent workers are men and women, young and old, live across the country, and reflect the racial, ethnic, and socioeconomic diversity of the country. Gig or independent work can be found across a wide range of occupations. It may include designing websites, driving cars, management consulting, care work, and more. Just as there is not one typical independent worker or one typical job, there is not one way to characterize the experience of participating in the gig economy. Diversity of experiences is a central theme of independent work. In Uberland: How Algorithms Are Rewriting the Rules of Work, Alex Rosenblat examines the role that algorithmic technologies play in managing workers. Here are some insights from Rosenblat on the this process and the ways in which algorithms are changing the nature of work. In a new working paper, Lawrence Katz and Alan Krueger examine the measurement of trends in work arrangements over recent years, including a revisit of their 2015 replication of the Contingent Worker Supplement. 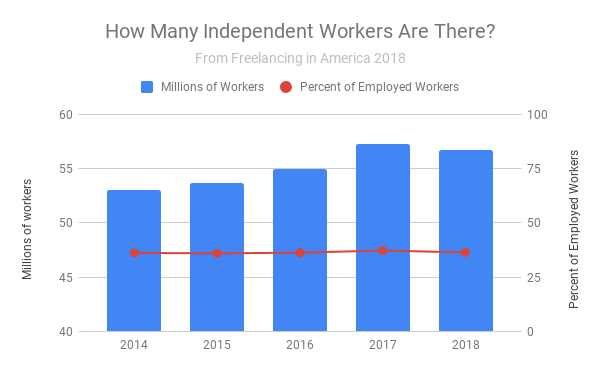 Annual survey conducted by the Freelancers Union and Upwork estimates 57.3 million American workers have engaged in some form of independent work in the past year. The Bureau of Labor Statistics released its first measure of electronically mediated work, which estimates 1 percent of workers use platforms--but challenges with the survey questions meant a burdensome process for researchers. The JPMorgan Chase Institute released a new report, The Online Platform Economy in 2018, updating and expanding their work from 2016 that uses bank account records to analyze platform participation and earnings.